I am excited to announce here first, the release of my new book, A Journey Through Ephesus. I began writing this book several years ago, with a desire to write an accessible commentary that not only gave contextual insights into the book of Ephesians, but also told the story of Ephesus. A couple of years ago, I was able to visit Ephesus with my brother, on a trip to Greece and Turkey. You can read about that particular visit, here. So this books comes out of both careful study of Ephesians, but also walking through the actual archaeological site! What follows is a description of the book. Ephesus was one of the largest and most influential cities in the Roman Empire. It served as the chief city of the Roman province of Asia. The city was also home to one of the Seven Wonders of the World, the colossal Temple of Artemis. Many notable figures from history passed through the city, thus Ephesus often found itself in the middle of regional disputes and political conflicts. It was this same city that also served as a base of operations for the Apostle Paul’s ministry to the province of Asia. Paul spend two to three years calling this city home, engaging the people and the surrounding pagan culture. So when Paul wrote his Biblical letter to the Ephesian church he founded, he wrote to a city that he was familiar with and knew held influence over the entire region. What can be learned when not only the book of Ephesians is studied, but the history of the city is considered, along with insights from both Roman and Greek culture, both of which shaped the city? Can we begin to see allusions to this city in Paul’s letter to Ephesus? What is to be made of some present-day assertions that Ephesians was not written to the city of Ephesus, nor even written by the Apostle Paul? A Journey Through Ephesus begins with the history of Ephesus, then provides a narrative commentary on Ephesians, and concludes with an examination of what happened to the church Paul founded. The entire context of The Greco-Roman culture of the city begins to emerge when we understand Paul’s purpose and audience in this comprehensive study of the book of Ephesians. As some may have noticed, I took a break from blogging for awhile. But in the near future, I will be adding some previews and excerpts from the book. As always, words of encouragement and feedback are appreciated. If you enjoy the book, please like, rate, review – whatever the case may be. It all helps spread the word! A Journey Through Ephesus is available at most online retailers. For all formats, visit my Smashwords page or click the cover image on the sidebar of the home page. New! Print version now available on Amazon! You get the idea. 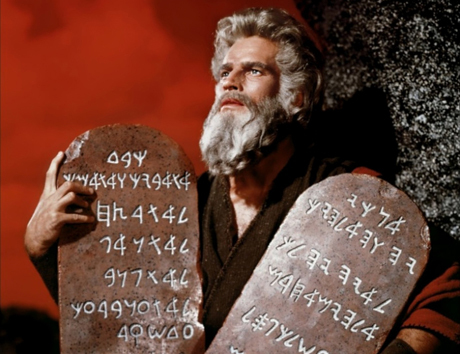 One way to make your list the definitive list is to attach the moniker The Ten Commandments of [insert topic here]. Atheists have even felt the need to come up with their own ten commandments. Yet there is something exceptional about this list. At a time when ideas were passed down orally, it is notable that God instructed Moses to write this list down – carve them in stone. God did not want the Israelites to forget this list. Additionally, at a time when nobody could really walk around with stone tablets to refer to, a list of ten words or phrases could be easily memorized and recalled. Today’s modern society does not memorize much of anything anymore. Thanks to the internet and smart phones, all we have to do is google a topic in order to recall it. Studies show that we moderns can recall two or three main points, far less than a list of ten. Jesus reduced this list of ten commands down to two: love God with all your heart and love your neighbor as yourself. Still, there is something enduring about taking a complex issue and reducing it down to ten bullet points. Perhaps this explains why the label, The Ten Commandments of…, will continue to serve as the defining list for any and every topic, be it dating or cruise ship buffets. Which way to the buffet? Today coveting also goes by many names and takes many forms, though the actual word has fallen out of use in our vocabulary. Our culture gives coveting more palatable names and even promotes some of these ways of thinking as good and healthy. “Greed is good” goes a famous line from the 1987 movie Wall Street and vestiges of that notion are still alive and well today. We are told that spending is good for the economy. We are not told what kind of spending; just spend. We are encouraged to overextend ourselves, from the homes we buy to the cars we drive. Yet we never encounter the word covet. It is a word that does not market well. We encounter the modern equivalent of coveting most notably in two common ideologies: materialism and consumerism. Materialism as a philosophy teaches that there is nothing beyond the material world and reduces everything to a tangible and material substance. The soul, the heart, and the spirit, among other intangibles, are either discounted or denied altogether. While most may not wholly embrace materialism as a philosophy, many are deeply affected by its influence and give credence to the philosophy by their lifestyle. Materialism, in its prevalent form, places the highest good on present enjoyment and tangible possessions. To quote the rich man in Jesus’ parable: “eat, drink and be merry.” We are bombarded by messages on a daily basis that promote this philosophy, and it is deeply engrained in our western culture. Materialism also leads to the second ideology of consumerism. Consumerism is one of those terms that mean many different things to different people. In its most innocuous form, consumerism is the economic notion that consumer choices should drive the economy, as opposed to a centrally-planned economy. In some forms, consumerism even encourages the consumption of material goods and holds that the increasing consumption of goods is economically desirable. However, as a growing ideology, consumerism is the idea that what we purchase will bring us some sense of satisfaction. At its worst, it is the lie that the next purchase will make us happy or bring fulfillment. Like materialism, many may deny holding such expectations, yet have spare rooms full of stuff that held out such promises. First, a bit of housekeeping. Trying to maintain two blogs – this one, as well as my site for Ten Essential Words – proved overly ambitious. So I have chosen to focus my energies on one site with more content. I have brought over the posts from the Ten Essential Words site, and thus you will notice a lot of new content here. Part of combining sites is completing the chapter previews. What follows is to that end. The Tenth Commandment reads, “You shall not covet your neighbor’s house. You shall not covet your neighbor’s wife, or his male or female servant, his ox or donkey, or anything that belongs to your neighbor.” The following is an excerpt from Chapter 10 of Ten Essential Words. Second, it is the only commandment that does not have a corresponding punishment. Each of the other commandments has a punishment associated with its violation. We have discussed the principle of reciprocity, but without an outward action associated with coveting and the difficulty in identifying when coveting occurred, there is nothing to reciprocate. Again, the Law seemed to assume that the punishment would be incurred if coveting led to breaking one of the other commandments. Because of these reasons, it is also the one commandment that has no real equivalent with other Ancient Near East law codes. It is the one commandment that explicitly points to God’s desire that these laws not simply be obeyed, but that their intent should transform the human heart. It would separate those in Israel who truly understood this intent from those who merely sought to conform to a legal code. We began discussing this Ninth Commandment with the modest example of ordering a cup of coffee. It may have seemed insignificant at the time, but it is in these little daily interactions that our name and our reputation can either gain or lose credibility. We may have lost some sense of the value of a good name – if it is not in a written contract, it usually is not worth anything today. But there are still places where our name has a certain value. The online garage sale eBay still relies on the value of a name. Each time a seller or buyer engages in a transaction, the other party has an opportunity to rate them. If the person was positive to work with, paid their money on time, or shipped the item in a timely manner, a point is added to that person’s name. A neutral experience nets zero points. A bad experience, such as a delay in shipment or failing to pay results in a point taken away from the person’s name. Each transaction, whether selling a comic book or purchasing a plasma-screen TV, counts the same when it comes to assessing the value of a name. In general, the larger the number, the more trustworthy the person will be. Here is a hint: avoid negative people – literally! What if we stepped out of the world of eBay and literally had a hologram number hovering above our head in real life? Every conversation and transaction either bumped that number up or pulled it down. Would it change the way you conducted your daily routine? Would it change the content of your conversations? To be people who embrace truth would mean that we would have no fear of that number hovering above our head. It would be visible for the entire world to see that we place a high value on honesty and speaking the truth in love. Truth is, that number is probably more visible to people than we realize. Consider the ways in which you can fully embrace truth. I recently had an opportunity to complete a brief interview for my author page on Smashwords. I thought I would share it here as well. As a pastor, I wrote sermon outlines, but I always felt like there was so much more to explore in any given topic. There was one series I had taught a couple of time, and even after teaching through it more than once, I still had ideas bouncing around in my head on the topic. Then on a trip to Israel with a couple of good friends, one of these friends encouraged me to start writing. I came home and began writing my first book, Ten Essential Words, where I really took a comprehensive look at the Ten Commandments and their relevance for today’s world. I’ve been writing ever since. There are several authors that I love to read for different reasons. Brennan Manning, who recently passed away, has probably influenced me as much as anyone. His writing really reaches deep inside me and brings out emotions and insights that tend to get pushed aside. N.T. Wright and Dallas Willard bring an intellectual approach to the Bible and to faith that I really resonate with. Bruce Feiler‘s books on exploring the actual places and sites of the Old Testament hit close to one of my biggest passions: traveling to places rich with Biblical history. I had finally finished the manuscript to my first book. Like any unpublished author at the time, I sent several book proposals to publishers. I was investing time and money, getting no where. Meanwhile, I had this manuscript saved on my hard drive, not being read by anyone. I began reading a couple books about how the internet was opening channels up to people that have been traditionally controlled by a handful of big players – be it record labels, publishers, or mainstream media. I realized that I had a choice to continue to play the game of getting the attention of a publisher or to go the indie route and get my ideas out there available to people. It has been both challenging and rewarding. Reading a good book at a coffee shop, most likely. But outside of work and writing, I always have a couple books I am reading my way through. I am always planning my next travel adventure. And when time permits, I enjoy cooking and trying new restaurants. I enjoy food that has been prepared with passion! I am really excited to explore the New Testament letter of Ephesians from the context of the Greco-Roman world of the recipients. Most commentaries tend to either lack depth, avoiding any contextual discussion, or be so deep, dissecting the sentence structure of the original language to an extent that the larger narrative is lost. I wanted to take a letter like Ephesians and really tell the story: who where these people, how would they have heard Paul’s words, why did Paul write what he did, and what did it mean to be a Greek person in the Roman Empire trying to live out the message of Jesus. This past spring, I actually travelled to the archaeological site of Ephesus, so I am really excited to finish this project! The Ninth Commandment reads, “You shall not give false testimony against your neighbor.” The following is an excerpt from Chapter 10 of Ten Essential Words. A cursory reading of other ancient law codes would indicate that laws against giving false testimony in a legal case were not as common as other laws, which is not to say they were absent. This may be the result of the ancients having a more holistic view of the trustworthiness of a person’s words: if a person was trustworthy, then it did not matter if their testimony was part of a legal proceeding, a business transaction, or simply part of casual conversation. Contrast this to our practice today of swearing in a witness as part of a legal proceeding, almost as if to say, “You can say what you want out there, but in here you must tell the truth!” In fact, witnesses in ancient Israelite and Greek trials were not usually placed under oath. There does not seem to be any Hebrew text in which a witness is said to have been sworn in, as we might conceive of it. Similarly, in ancient Athens most witnesses were not placed under oath, and prosecution for false testimony did not depend on whether a witness testified under oath. In essence, we might say that in ancient times, a person was continually under oath. If you recall, this entire topic of oath-taking was also covered under the Third Commandment regarding taking Yahweh’s name in vain. In some sense, the Third and the Ninth Commandment are almost redundant. To revisit the topic, an oath was similar to making a covenant, but could have a lesser, informal meaning of simply buying something or making a promise – but binding none-the-less. Oaths usually involved invoking the name of a deity as a witness as well, hence the prohibition against using the name of Yahweh in this fashion. While oaths were the language of treaties and contracts between people, and breaking an oath had serious consequences, giving false testimony was the language of the legal system and referred specifically to the credibility of the witness. In essence, with this Ninth Commandment, Yahweh was protecting the integrity of the legal system that had just been put into place. So with its original inclusion into the Ten Commandments, this commandment had an unmistakable legal undertone to it. Yet, as with many of these commandments, the Hebrew Scriptures continue to broaden their application beyond the legal realm and into everyday life. Turning again to the book of Leviticus, where the Ten Commandments are reiterated and expounded upon, the Law expands on this commandment prohibiting the giving of false testimony, “Do not steal. Do not lie. Do not deceive one another. Do not swear falsely by my name and so profane the name of your God. I am Yahweh” (Leviticus 19:11-12). So the broader concept, “Do not lie,” associated with this commandment is not off the mark. While we can see a wide range of dishonest activities associated with lying included here, we cannot miss that last statement, “I am Yahweh.” With that simple addition, God was constantly reminding the people, “I am Yahweh … who brought you out of Egypt. I am Yahweh … who has led you this far. I am Yahweh … who will make you into a great nation.” These commandments are the righteous standards of Yahweh, and when we deviate from these standards, we stray from the righteous life Yahweh desires of us.